Someone once said “there is no such thing as bad publicity”, and “don’t fix what ain’t broke.” Then again, someone also once said “the world is flat” and “people in glass houses sink ships”. Maybe we should stop listening to ‘someone’. 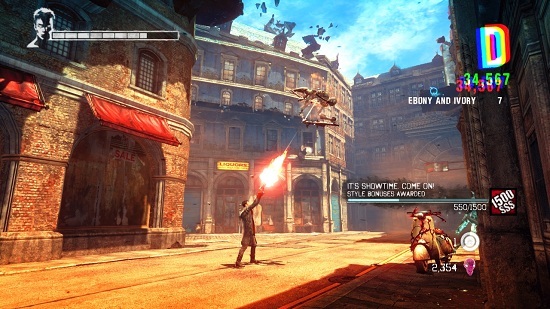 Few video-games have been assaulted with as much controversy and bitterness as the recent reboot DMC: Devil May Cry. 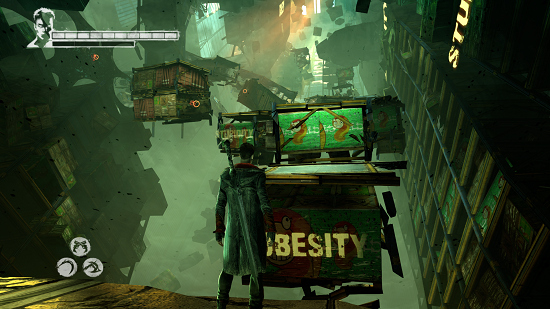 Devil May Cry is a long-running and well respected series of action-packed hack-and-slash games. Starring Dante, a half-demon, who fights demons, monsters and uppity family members with his swords, guns, cocky attitude and magnificent silver hair. The games were a revolution. Fast paced action with hard-rock music and a hero everyone wanted to be, spawning an anime series and several ranges of figurines. Therefore, when British developer Ninja Theory (famous for the critically acclaimed Enslaved) announced and debuted their DMC reboot in 2010, fan reaction was a little negative. The new Dante was younger, dirtier and (god-forbid) dark haired. While still a cocky badass, fans felt he lacked the savoir faire and charisma that originally made Dante an icon. Fans felt it was the end of an era, and that the new game would fail. But now that the new DMC has been released is it possible the fans were wrong? The game pits Dante, a half-angel half-demon hybrid known as a Nephilim, against the powerful demon Mundus, who rules Limbo city with his demonic forces. Dante soon teams up with his brother Vergil (the leader of the rebellion against Mundus) and Kat (a psychic girl). The story mirrors the original’s narrative, but is updated for a modern audience. Vergil’s rebellion will remind anyone in the know of the group Anonymous; the leader of the Raptor News propaganda practically is Bill O’Reilly and the game takes place in the vibrant and hostile Limbo City, not an isolated island or castle. Throughout the story you’ll learn of Dante’s past, embrace his heritage and, with plenty of attitude and bullets, smack down the demons. Gameplay has remained almost identical to its previous iteration. You guide Dante through a beautiful and well-crafted level combating demons, traversing obstacles and solving puzzles. Combat remains the main draw to the game and is just as slick and satisfying as before. Players have their choice of toys to bring to the battle field with nine weapons to play with. These include series staples like the Rebellion Sword, Ebony and Ivory Pistols and new additions such as an axe, scythe, whip and shurikens. Fighting is easy to learn, challenging to master. The face buttons control your sword and pistols, while holding a shoulder button switches to either an Angelic or Demonic weapon. This means that multi-weapon combos are easy and intuitive to string together in a gory medley of doom. Instead of carrying multiple weapons (as in the previous games in the series), Dante’s sword morphs into whichever melee weapon you need. Angelic weapons tend more towards crowd control and speed, while the Demonic weapons are the heavy hitters. Button mashers and skilled-fighters will both feel at home with the system and most fights will end with you on the edge of your seat, wondering how the hell you just did that. But Ninja Theory isn’t just showing off with combat, as all aspects of this game shine through. The voice-acting is spot-on and well suited. The music is a little different to the rest of the series, branching off from the exclusively hard-rock to a sweet mix of techno, alternative and heavy rock. The story is well delivered and thankfully lacks the melodrama and cheesiness that plagued the series. 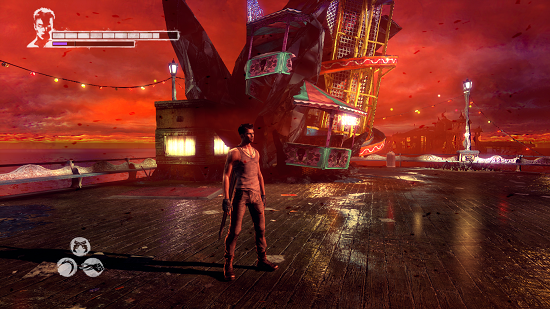 Graphics have a tendency to go dark and muddy during cutscenes, but are vibrant and ambient during gameplay. However, one of the best features is the inspired level design. The city is a dangerous and demonic place with the tendency to deform, explode or flat-out attack Dante at any given time. The ground will split while running, platforms will fly-off while you’re jumping for them and taunts will glow on walls as you pass. Throughout the game you’ll feel that the very world around you is alive and ready to pounce. For the most part DMC is a masterfully crafted action romp, though no game is without its faults. The lock-on mechanism present in the previous games is strangely absent, and while the boss battles are spectacular and inventive, there is little substance to them. 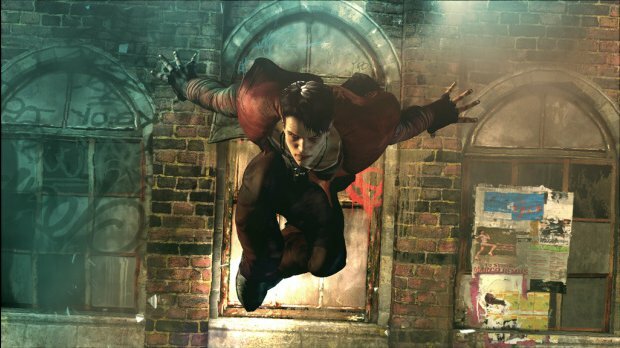 In short, DMC: Devil May Cry is a breath of fresh air for the series and hopefully a sign of things to come. Small kinks need to be ironed out, but the overall experience is well rounded. Replay-value comes from trying to beat your high-scores and find more hidden items, while free DLC is on the way. If you’re a fan of action-adventure with over-the-top antics, then this reboot is most definitely for you.